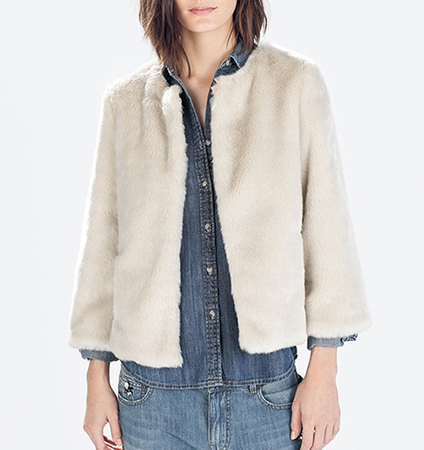 This is an adorable faux fur jacket that you will love wearing with skirts, jeans and slacks. It is cut fashionably short and is intended to be worn open and loose. Therefore, it has no zippers, snaps or buttons. This jacket is presented in a lovely shade of off white. It features three quarter length sleeves that end between the elbow and wrist. The jacket has a simple, round neckline. We recommend dry cleaning only for this garment. It is available for purchase in sizes Small, Medium and Large.